Two tricksters posing as employees with the district courts have scripted a unique fraud. They recruited a number of unemployed youths as “pyadaas” (process server in courts), making them travel as they served summons on fake persons. 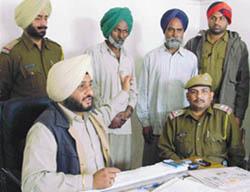 The police with the accused who were caught in a recruitment scam. 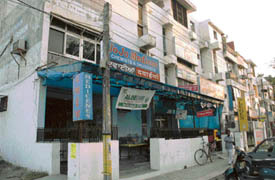 In a blatant violation of land use norms and building bylaws, residential complex comprising HIG flats on the Maharani Jhansi Road near the Ghumar Mandi area in the city, has virtually turned into a thriving commercial centre as the Improvement Trust officials appear to have closed their eyes to the unlawful activity. Two families of Sihar village have sought the intervention of Sikh organisations as they are being “isolated” by residents of the village. District Magistrate, Ludhiana, Anurag Verma today ordered a magisterial inquiry into the alleged illegal detention and custodial harassment of a city hotelier by the Kotwali Police . Partially decayed body of one labourer was retrieved after three days of joint efforts by villagers and the administration today evening while the 'rescue' operations for the retrieval of another youth who was feared dead by now were still on. Tension gripped Bulara village as some Muslims tried to prevent some people led by Akali leader and SGPC member, Balwinder Singh Bains from erecting a boundary wall on about four acres. While the Muslims maintained that the land was meant for the property of a graveyard, Mr Bains claimed that he had a lease order from the Punjab Waqf Board. Ludhiana MP and president of the Youth Akali Dal, Mr Sharanjit Singh Dhillon, today criticised the Punjab government for its wasteful expenditure. He alleged that the government was spending money on unnecessary things while the youth of the state was facing unemployment and the state was facing the resource crunch. Expressing serious concern over allegations of corruption levelled by Mr Ashok Singh Garcha, Chairman of Ludhiana Improvement Trust against several of his own party leaders including City Mayor Mr Nahar Singh Gill and one of the trustees, the Bhartiya Janata Party has said that the trading of charges in public had brought the real face of the ruling party before the people. If the fresh proposals of carving out the new constituencies and declaring some as reserve in Ludhiana are accepted, a political storm is likely to brew in the district. Residents of E-Block in Shaheed Bhagat Singh Nagar on the Pakhowal Road are sore over the insanitary conditions prevailing in the locality as a result of indifference and apathy on the part of officials of Ludhiana Improvement Trust (LIT). The Dhan Pothohar Brotherhood will organise a sabhyacharak programme in the last week of December which will be dedicated to the tercentenary martyrdom of the younger Sahibzadas of Guru Gobind Singh, who were enclosed alive in a wall 300 years ago. The Apex Chamber of Commerce and Industry today said that despite reduction of tariff the Punjab State Electricity Board was issuing monthly electricity bills at old rates. City police today released the sketches of three of the five suspected thieves who took away a black Scorpio jeep from the house of an exporter in Block-K of Sarabha Nagar two days ago. Sketches of jeep theft suspects released by the police in Ludhiana on Wednesday. For Hero Cycles, it has been a long and continuous journey. 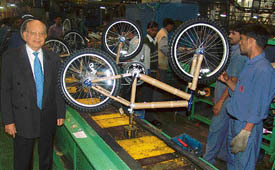 It continues to be the largest manufacturer of bicycles in the world with an average production of 15,000 units a day. The Jammu and Kashmir Minister of State for Sports and Youth Affairs, Mr Yogesh Sawhney, said here yesterday that there was a visible change in the mood of people in his state. During a conversation with reporters here today, Mr Sawhney claimed that the situation had improved and was heading towards normalcy. The issue of service tax appears to be getting murkier with the industry planning to go for litigation or protest against it. The leaders of various organisations led by Mr Jagpal Singh Khangura, in charge of the Congress Committee, Kilaraipur, and Mr Gurcharan Singh Galib, former MP, felicitated the newly appointed Chairman of the Market Committee, Kilaraipur Mr Manmohan Singh Mohni, at a function organised in the village today. Bajaj Auto and Dada Motors today organised two-wheeler loan mela for government employees. The three-day loan mela, which will conclude on December 10, is being organised in Mini Secretariat here. 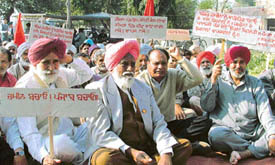 Led by activists of Punjab Kisan Sabha, a large number of farmers today sat on a dharna at Mini Secretariat here demanding an immediate end to harassment of farmers in Bet area of the district. The Punjab Institute of Management and Technology (PIMT) organised "corporate day" on the campus of the institute yesterday. Top executives from reputed organisations interacted with students on various issues. It’s interview time for parents! The parents of children taking admission to kindergarten seem to have lost their sleep with the admission forms being available in various schools. The teachers of the playways have already started preparing their students with mock interviews. Going by the stress level and anxiety among the parents, it seems as if it is interview time for parents and not for children. Guidelines have been issued to the candidates contesting elections to the District Bar Association. They have been restrained from sticking posters, defacing court complex and serving liquor in the New Judicial Complex. Any violation could lead to disqualification of the candidate. District Bar Association (DBA) president Mr Balwinder Goel today claimed that elevators in the Lawyers’ Complex would be made operational within 15 days. The local unit of the Food and Nutrition Board, Department of Women and Child Development, organised a five-day training programme in nutrition education today. Fifteen participants, including child development project officer and supervisors from ICDS Department of Punjab attend the programme. Manpreet Kaur has been named captain of the sub-junior Punjab football team for participation in the Sub Junior National Women Football Championship to be held at Dindigal (Tamil Nadu) from December 9 to December 24, 2004. The Sales Tax Department today urged dealers to get their assessments done at the earliest so that the over 1.25 lakh cases pertaining to Sales Tax Assessment that were pending with the department could be cleared.